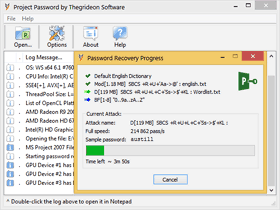 Project Password by Thegrideon Software is an advanced and highly-optimized password recovery tool for MS Project documents (*.mpp) and templates (*.mpt). It works with MS Project files from all versions including the latest Project 2019 You may also check VBA Recovery Toolkit to access VBA Projects source code. Write Protection passwords are recovered or removed instantly. All passwords for MS Project files up to the version 2003 are recovered instantly. preset or custom char replacements: Ss with 5, Bb with 8, Ii with 1, etc. Utilizes modern Intel HD Graphics GPUs. All MS Project versions are supported. Methods used in MS Project 2007 - 2019 are based on strong cryptographic algorithms (SHA-1, SHA-512, AES) and password recovery cannot be guaranteed in a fixed timeframe. Moreover due to iterative methods used in password verification recovery speed is limited. 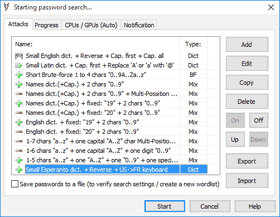 In order to recover these types of passwords, candidates have to be created based on wordlists, sequentially with a charset and length selected or as a mix of parts. Project Password allows you to set several attacks in a queue, split password in parts with virtually endless number of combinations and precise search range setup. 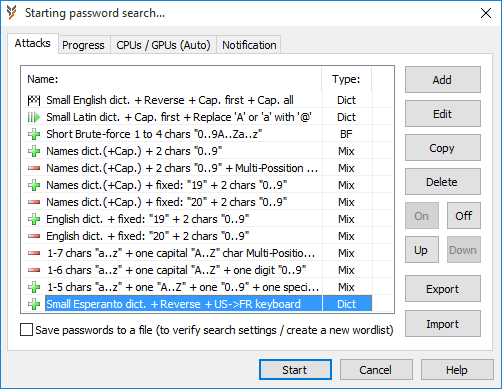 Additional modifications are available including unique keyboard layouts-aware recovery technique, char replacements (e.g. T or t with 7), etc. You may also check Password Search FAQ. We did our best to enhance this tool performance as well as the recovery speed with some advanced methods and it found to be the fastest tool for MS Project "password to open" recovery. Password recovery speed for very common hardware is available below to back this statement up. For example (Project 2007): Intel i3 + Intel HD 4400 GPU + AMD R9 280X = 10 500 + 4 100 + 250 000 = ~264 000 p/s (passwords per second). For cards with compute capability sm_35 (Kepler 2.0) and above (Maxwell, Pascal, Volta) you can expect approximately 12000 p/s per every SM running at 1000Mhz for Project 2007, 1200 p/s for Project 2010 and 160 p/s per SM for Project 2013-2019. Test results below are shown to be very close to this estimation. AMD GPUs are very "password recovery friendly" and consistent with architecture change from VLIW5 to VLIW4 and now to GCN. You can expect approximately 7500 p/s per every CU running at 1000Mhz for Project 2007, 750 p/s for Project 2010 and 130 p/s per CU for Project 2013-2019. Trial version can be used to check format and hardware compatibility. It allows you to setup and test run any password search for up to 15 min per set. Recovered passwords are hidden behind the asterisks.